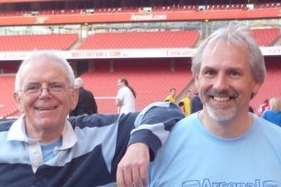 The Arsenal History Society meets Brian Talbot: a most fascinating discussion. Chaos at the Arsenal. The dramatic and bizarre story of February 1927. Below are the Arsenal (and for historical context, occasionally one or two non-Arsenal) anniversaries for today taken from the complete files of over 6000 Arsenal anniversaries which appear on the Arsenal History Society website. An index to the monthly Anniversary files can be found in the right column of this site under “Pages” on the right of the screen. The index to the current historical series on this site can be found at Henry Norris at the Arsenal. An index of all our main series can be found on the home page. Our headline today comes from 1997. Four new articles added to this day’s anniversaries in the last year. 18 October 1910: The trial of Dr Crippen opened at the Old Bailey. 18 October 1919: First match for Stephen Dunn – a 1-1 home draw with Everton. He was a goalkeeper who also played for the first team as a full back when he injured his wrist. 30,000 were in the ground as Arsenal remained 10th. 18 October 1922: The BBC was formed, and there was much need for independent news at this time as the government was about to resign over the Chanak Crisis. Meanwhile Sir Henry Norris informed his local party that he not going to stand in the next election and that he suspected they would have difficulty finding anyone else (which turned out to be true). 18 October 1924: Final game for Robert Turnbull; he became Arsenal’s most prolific scorer thus far (with 22 goals) after being switched from fullback to centre forward. After this last appearance he was put on the transfer list and sold to Charlton Athletic in November. See also here. 18 October 1930: First game for Joey Williams. He had played 82 games for Stoke before joining Arsenal in 1929 and played 22 games for the club, leaving in 1932. On this day Arsenal beat Man U away 1-2. 18 October 1933: Arsenal beat Everton 3-0 in the Charity Shield in front of 30,000 at Everton’s ground, with an unexpected appearance from Norman Sidey Birkett (2) and Bowden got the goals with Hill taking over the number 11 shirt. Norman Sidey continued his run at centre half. 18 October 1948: Wally Barnes international début. He went on to play 22 games for his country and scored one goal. 18 October 1951: Lawrie Scott was transferred from Arsenal to become player manager at Crystal Palace but after Palace had to apply for re-election in 1954 he moved on to Hendon and later Hitchen Town. 18 October 1958: David Herd made his international debut. He went on to play five times for Scotland and scored three goals. 18 October 1968: Jimmy Robertson signed from Tottenham in exchange for David Jenkins. He eventually took over the number 7 shirt from John Radford on 31 March 1969 and got a run of games to the end of the season. 18 October 1969: Nelson Vivas born in Santa Fe, Argentina. He had a rare ability to play anywhere in midfield or defence and after seven years as a professional in South America he came to Europe and started with AC Lugano on loan, after which Arsenal signed him for £1.6m in August 1998. 18 October 1978: Hajduk Split 2 Arsenal 1 in the Uefa Cup, a capacity crowd of 25,000 looking on. Heeley and Kosmina were called up to fill in the gaps left by Sunderland and Walford. 18 October 1983: Peter Nicholas returned to Crystal Palace. A series of injuries in the 1982/3 season reduced his potential and he had been on loan since August. His return fee was £150,000, but in 1985 he was on the move again, going to Luton Town, playing for them over 100 times. 18 October 1985: Bryn Jones died. After leaving Arsenal in 1949 having played 71 league games he coached at Norwich from 1949-51 and then ran a newsagent shop in Highbury. 18 October 1997: Arsenal start a run of two wins in eight matches with Crystal Palace 0 Arsenal 0. This was also Alberto Mendez’ league début. And it was the 11th league game of the 2nd Double Season The second double: part 1, part 2, part 3. 18 October 2003: Arsenal beat Chelsea 2-1 to make it seven wins and two draws in the 9th league match of the unbeaten season. Edu and Henry scored to make it three wins in a row. 18 October 2005: Thierry Henry beat Ian Wright’s scoring record with two against Sparta Prague in the Champions League in a 2-0 away win. Arsenal went on to win the first five group stage games, and then drew the sixth. 18 October 2010: Vito Mannone loaned to Hull for the season. His loan was then continued until 2013, at which stage he left Hull having played 31 times for the club. 18 October 2011: Vermaelen signed a new contract with Arsenal. He stayed until 2014, but his career was seriously hampered by injury, playing 110 times all told. Thank you – I will get it changed in the files. Mukhtar it was 1989 not 1990. Thanks for pointing this out.